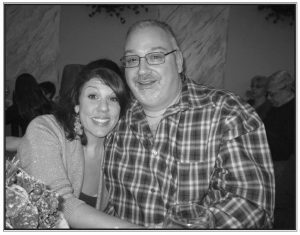 This year’s Exhibitor’s Book is dedicated to Dianna and Dave Popolizio. Upon becoming members of the Guilford Agricultural Society, both Dianna and Dave jumped in with both feet when it came to volunteering. There was nothing that they would not help with, be it at the Fair or during the off-season. Before long, Dianna took over the responsibilities for the Poultry Department. Over time, she has added many educational aspects to the department. She has also “spruced up” the department so that the tent is welcoming and easier to view the birds. When Beth DeRosa Linsley took a short leave of absence from the Ag Society, Dianna was voted in as the Secretary. She has continued to do a fabulous job and excels at keeping the membership updated in all things Guilford Fair. Dianna has also graciously stepped up to the plate to assist with our Fair software implementation. Dave began his tenure with the Ag Society helping Dianna with the Poultry Department. He also volunteered for security. Over time, he assisted with running the security aspect of the Fair and now manages our Security Department. Always looking for a challenge, Dave wanted to become even more involved with the Fair. Under the mentorship of Nancy Keeler, Dave has taken over the responsibilities as the Concession Superintendent with Nancy as his Co-Superintendent. Dave and Dianna’s love for a fair steps far beyond the Guilford Fair. They continually visit many fairs in Connecticut, as well as out of state fairs. They are always looking for new and innovative ideas that can be implemented at our fair. Dave and Dianna continue to be ready and willing to volunteer in any capacity for the Guilford Agricultural Society. We are lucky to have them as members of our Fair Family.